"He was doing overtime for me, poor old Tiff. It's just Disneyland, fairytale stuff." The words of Grand National-winning trainer Mouse Morris on a day when the famous race delivered a plot Hollywood might struggle to match. Irishman Morris had just won the Aintree marathon for the first time with the aptly named Rule The World, less than a fortnight after landing the Irish equivalent with Rogue Angel. Tiff, or Tiffer, is the nickname of his beloved son Christopher, who died last year aged 30 of suspected carbon monoxide poisoning in Argentina. It was like karma. The tragedy. Then the triumph. Teenage jockey David Mullins was enjoying his own fairytale too after his first ride in the race, with the celebrations shared by airline boss Michael O'Leary. Mouse Morris has few airs and graces, which belies his rather refined family background. The son of Lord Killanin, former International Olympic Committee chief, he is a quietly spoken, scraggy-haired Irishman who must smoke 40 cigarettes a day - at a conservative estimate. Michael Morris earned the nickname Mouse when he was an amateur rider. His brother Redmond is a film producer whose credits include 'The Reader'. The 2016 Grand National might be another project. Mouse was sent to Ampleforth College in Yorkshire, although reports suggest he "showed little enthusiasm" for school. He wanted to be a jockey, showed enthusiasm for that and became one of the best of his generation, including winning Cheltenham's Queen Mother Champion Chase twice in the 1970s on Skymas. Mouse, who is based in Tipperary, turned to training 36 years ago. This first National triumph, after 17 previously unsuccessful runners, adds to a CV that includes a Cheltenham Gold Cup triumph with War Of Attrition in 2006. When I asked him on Friday if he might do the Irish-English National double, he looked to the skies and said: "He's answered the question once, he might not answer a second time." There are various theories about what you need to win the National, but 33-1 outsider Rule The World did not pay any heed to them. This was his first win over fences, in the most famous horse race in the world. Two serious pelvic injuries meant the horse had spent some time on the sidelines, but he was nursed back to fitness and finished a narrow runner-up in last year's Irish National. "When you consider the injuries he has been through you can only call him a horse of iron, but a pure gentleman," said Morris, who turned 65 on Monday. For much of the race it looked like the joint favourite The Last Samuri might triumph for trainer Kim Bailey, who has also had his lows since winning here with Mr Frisk in 1990. Bailey, back in the limelight in recent years at his Gloucestershire base after some fallow seasons, had to settle for second this time, while 100-1 chance Vics Canvas was third, ahead of Gilgamboa and Goonyella. Mixed feelings then for Gary O'Brien, a part-owner of Vics Canvas and full-time TV presenter on the At The Races channel, who was part of the BBC Radio 5 live commentary team. "If someone else was going to win, then I'm glad it's Mouse," he said. Jockey Robert Dunne somehow managed to stay aboard Vics Canvas despite a major blunder at Becher's Brook first time round, and keep him in contention. "I couldn't believe what I was watching. I was just in disbelief after all the ground he lost. I am incredibly proud of him. I thought [winning] might even happen," added O'Brien. Beforehand, the chat had been whether last year's champion Many Clouds could become the first horse to win consecutive runnings since the legendary Red Rum. The 8-1 joint favourite travelled well early on but a big mistake put paid to his chances and he trailed in last of the 16 finishers for jockey Leighton Aspell, who was seeking a third straight National triumph having partnered Many Clouds to victory in 2015 and Pineau De Re a year earlier. As boss of budget airline Ryanair, Michael O'Leary can come across as a brash, no-nonsense individual. Around the racetrack, he cuts a different figure - enthused and interested by horse racing in his role as the kingpin of the Gigginstown House Stud racing operation he heads with brother Eddie. Before 2016, Michael's only previous experience of the National was a hollow one - seven years ago his Irish National winner Hear The Echo collapsed near the Aintree finish and later died. The fact this was the fourth year running where there were no equine fatalities shows the race has progressed since major changes to the fences and other modifications. It also completed a major treble for O'Leary, who also owns last month's Cheltenham Gold Cup victor Don Cossack, in addition to the Irish and English National winners. "I think I should now stop, because it's not going to get any better," he said. Spare a thought for O'Leary's retained rider Bryan Cooper, who chose stable-mate First Lieutenant over Rule The World, and fell at the second of 30 fences. With a 20th birthday in June, Mullins - the nephew of champion Irish trainer Willie - is the youngest winning jockey for several decades. He rounded off a dream day by winning the next race as well, on 16-1 shot Ivan Grozny - completing a double which had combined odds of 578-1. Mullins, much like most of the clan, is a rounded individual who even at 19, appears to understand the vagaries of life. The winning and the losing. When quizzed by the press with the mud still on his face long after that second victory, the young jockey claimed that he turned to riding full-time because he "wasn't the cleverest kid in the class". Asked what he would do next, he said: "Become a film star", before suggesting that he didn't really have the looks. Could he sum up the day? "It's special and magic. I've never had a feeling like this. "Rule The World is an aptly named horse. It's his first win over fences, which is more amazing than me having a first ride over them." I asked him to sum up Morris. "He's probably the best trainer I've ever seen to prime a horse for the big day," said the teenager. "He assured me he'd run a big race, and by God he did. Mouse was right." 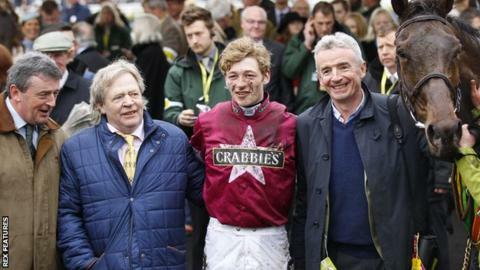 Mullins has it all to look forward to. Sadly that can't be said of the trainer's son, who died last June. Losing a child is the terrible grief that is not supposed to happen. The pain of a parent who should normally depart long before their offspring. "Nothing can replace the loss of a son, but to win the Irish Grand National and now the Grand National, it shows that life goes on," said O'Leary. The world moves in mysterious ways. It's not often you'll get the lyrics of a Take That song into a piece about horse racing but it somehow seems appropriate. "Yeah, you and me, we can ride on a star… We can rule the world." Where did your horse finish in the National? Read more on Grand National 2016: Full result, finishers and fallers - where did your horse finish?